Leading Manufacturer of ratchet lever hoist from Kolkata. 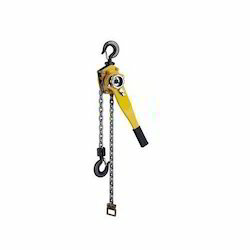 With the help of experienced professionals, we are able to offer a wide assortment of Ratchet Lever Hoist. These are manufactured using superior quality raw material which we source from reliable vendors of the market. All the products offered by us find its application in various industries such as chemical, oil and fertilizer industry. Further, these lever hoist are available to clients in various sizes as per the requirement of our clients. Looking for Ratchet Lever Hoist ?